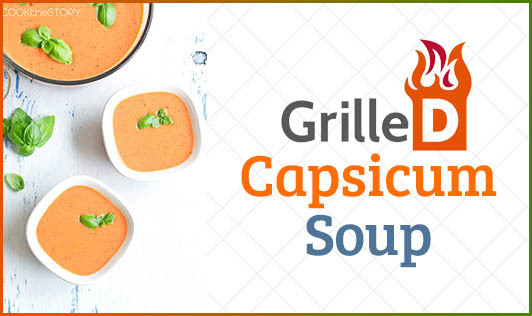 This simple delectable soup is rich in folic acid and vitamin A. Rich in fiber and antioxidants, this soup will help keep your cholesterol in check and prevent heart disease. • Pierce the capsicum with a fork and roast on a medium flame until it turns black on all sides. You can also grill it. • Cool the capsicums and keep aside. • Once cooled, remove the skin, stem and seeds, and roughly chop them. • Add tomatoes, garlic, bay leaves, and 3 cups of water in a deep nonstick pan and simmer on a medium flameuntil the tomatoes cook and turn soft. • Cool the tomatoes and throw out the bay leaves. • Add the tomatoes and capsicum in a blender and blend until smooth. • Transfer the blended puree back to the pan, add the corn flour paste, and cook on a medium flame for 2 minutes, while stirring continuously. • Season with salt and sugar, and mix well.